A full-page illustration for England's MOJO magazine, to accompany the review for MOGWAI's "Happy Songs for Happy People." Approx. 12" x 15" or so, off the top of my head, with plenty of trim for framing, it's on 14" x 17" illustration board. 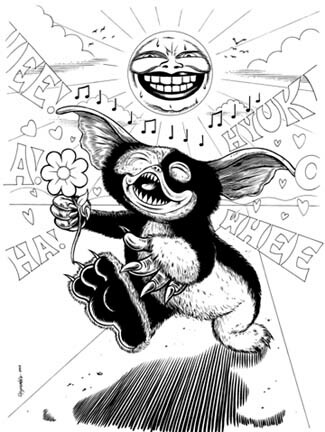 Apparently, the band Mogwai named themselves after the Gremlin of the same name; I was asked to illustrate a ridiculously happy mogwai of that kind. Only after I was almost done did I realize I completely channeled Archer Prewitt's Funny Bunny, just not as good.